29 January 2016: The Oscar-nominated shorts are now showing in New York City at the IFC Center, and minus the documentary ones in the Bay Area at San Francisco's Landmark Opera Plaza and Embarcadero Theaters and Berkeley's Shattuck Theater. Five days after the 2016 Academy Award nominees were announced, we have theatrical playdates for the short films that made the cut. ShortsHD, a cable channel dedicated to short films, and Magnolia Pictures are teaming to put The Oscar Nominated Short Films 2016 in moviehouses January 29. The program — which includes all 15 live-action, animated and documentary shorts — will screen in more than 400 screens across North America. I'll comment briefly below on the live action and animated shorts nominees. They hit theaters Jan. 29, including San Francisco Bay Area theaters (Landmark Embarcadero, San Francisco; Landmark Shattuck, Berkeley) I won't preview the documentary shorts. In addition to my comments on each of the live action and animated nominated shorts, see Stephen Holden's review of the shorts for the NY Times and my additional comments on Filmleaf inspired by Holden's. Comment: This is a witty and stylish little film with droll but somewhat cruel humor. 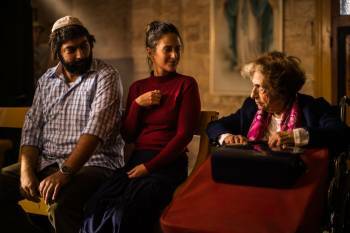 It is a Palestinian film that ruthlessly satirizes snotty, spoiled, quarrelsome Orthodox Jewish Israelis who, apart from the arguable excess of the usual ruthless Orthodox Sabbath rules against performing anything deemed to be work, even dialing a phone number, do nothing but argue and squabble among themselves. The Christian nuns are silly too, with their own unrealistic and impractical practice, a vow of silence. But they at least have some ingenuity as well as the decency to overlook the Orthodox family's rude and condescending manner. It's a little hard to know how to take this film given its level of ethnic satire; but its vividness, clarity and humor are admirable and play well. The statue of the Virgin Mary falling over at the end provides a neat, elegant coda. There is good sense of real-time pacing and structure here. Synopsis: On the heels of a painful divorce, an Afghan-American woman joins the U.S. military as an interpreter and is sent to Afghanistan. 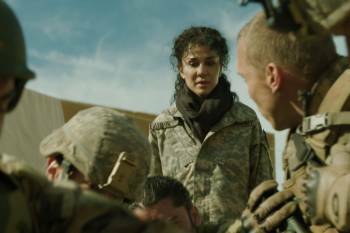 On her first mission, she accompanies troops pursuing a bomb-maker, and must bridge the gender and culture gap to help the man’s pregnant wife when she goes into labor. Comment: First days on the job can be tough, especially in a war zone. A fledgling young woman interpreter for Americans in Afghanistan gets a baptism of fire. The filmmakers lay it on heavy, and it may seem rather artificial, generic, over simplified, over dramatic. (This is based on personal experience, but still.) Nonetheless it is easy to see why this would stand out to the jurors selecting best entries. It demands, indeed screams for, our attention. And there is a (partly) happy outcome. The new interpreter helps bring a child into the world. Not everything goes so well. The film is rich with drama, and we get a glimpse of modern education and up-to-date medical knowledge butting head-on into virtually medieval social and religious customs -- in a benighted country the US has helped wreck. One won't forget this film in a hurry. Or will one? Extreme action isn't always the most memorable. There is no time for subtlety here and I'm not sure the actors are quite up to the pressure. Comment: First Kosovo-made film to be Oscar-nominated; the director is a Brit collaborating with Kosovo crew. The focus is children in wartime and two Albanian boys: Oko, who gets a bike, and Petrit, who does business with Serbian occupiers to earn himself the money to buy wheels for himself. Pressures on the friends increase as the war escalates. The film deftly establishes at once a contrast between the worldly, plump Petrit and the more delicate, idealistic Oko. The beauty of this film is the way it explores the rocky friendship of the two boys in relation to the growing horror of the Albanians' situation under Servian occupation, and though things turn violent and ugly beyond words, the action takes time to breathe. It is a fine and sensitive film that vividly draws us into the terrible world of civil war and ethnic cleansing from a child's poin of view. Comment: This is a theme that goes back decades: the way, sadly, people are tempted to use online relationships as a way of hiding truths about themselves and deceiving others about who or what they really are, leading to heartbreak. The young London typographer (he's good with words in all ways but speaking), who lives with his understanding dad, conceals his severe stammer from the woman he's been online-dating for six months; now she wants to meet in person. The trick, for us, is, in his head (the voice we hear) he speaks perfectly normally, so he is constantly rehearsing speeches he will never be able to deliver, a great jumble of conversational gambits. This device, and the online conversation, enables the short film to convey a great deal of text in a very few minutes. Maybe the surprise ending will occur to you before it comes, but this is an ingenious and thought-provoking piece that becomes a study in disabilities. It doesn't hurt that the lead (stage actor Matthew Needham) rather resembles the always-appealing Ben Whishaw. The film rambles just a bit and drags to a near-standstill in its last moments; it may linger over its tension and approach-avoidance a bit more than necessary; but it's all about its doubletake - very O. Henry. [ Moderator Control Panel ] For a brief excerpt go here. CONCLUSION: Nothing here is unworthy; all show superior talent. 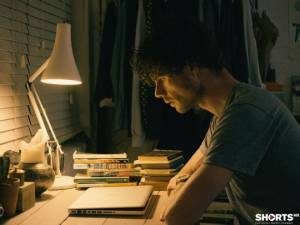 My leaning is toward "Stutterer," despite the pacing issue, because of its relative subtlety. I feel browbeaten by the sociopolitical messages and attempts to pack too much into a few minutes, except "Ave Maria," if it's not offensive, is rather droll. Comment: It's a sad, somewhat saccharine story, with repetitious tinkly music that rings in your ears after it's over, and no fun at all. 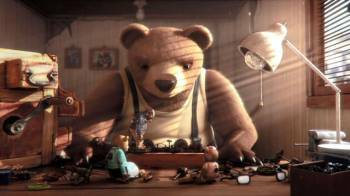 Elaborate animation that looks like stop-motion. Is it? This is a commentary on the exploitation of animals. Technically it's superb, handsome to look at. But it's rather lifeless, the images are somewhat repetitions, and overall it's certainly joyless. If you like intricate, elaborate animation, this may be the one for you. 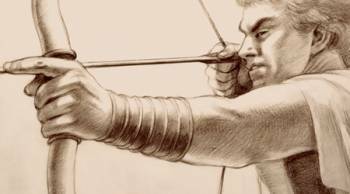 Synopsis: 2,400 years ago, four warriors — two Spartan and two Athenian — battle to the death in an intense struggle witnessed by a little girl, who then runs to her grandmother for comfort. 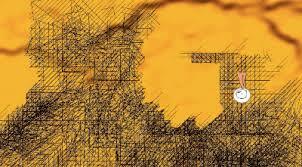 Comment: This is old-fashioned hand-drawn animation, rather monochromatic, with a line-drawn look, illustrator stuff. A big part of its appeal is its classic use of the medium of animated film. The action however is extremely gruesome. You would certainly not want a real little girl to witness it. A little surprising this was nominated. Comment: Well, this is Pixar/Disney, so it has that look, but the difference is that the boy allegedly obsessed with TV (it's not really proven) is led by his father's Hindu worship into a fantasy world that's a mix of Marvel Comics and traditional Indian art. Here, the filmmakers tend to settle for a dazzling visual display rather than storytelling depth, though the images are certainly glorious for a while. Too bad the sound effects are relatively crude. But the fact that this may be the artist, Sanjay Patel's homage to his father makes it a rather touching film. Synopsis: A little girl named Emily is taken on a fantastical tour of her distant future by a surprising visitor who reveals unnerving secrets about humanity’s fate. Comment: The adult has a British (Australian?) voice. This is a delightful film that reminds me of more adventurous "Best of Annency" animations visually with its vibrant use of simple lines and circles, primary colors, many scenes -- and in this case, an elaborate sci fi tale of a future clone contacting her "prime," a small child from eons back (whose authentic child voice and short comments are hilarious) and lecturing her on how future generations of clones will descend from her, etc., etc. Spoiler alert: Life is long and fascinating, but ends "horribly" and many get lost in space or time. The concepts being expounded upon are tricky and ingenious and may not make complete sense the first time through. Comment: The concept of comradely friendship is very Russian; to Americans it might seem almost gay. The two bros train as Cosmonauts together and are best friends and more. Only one goes up in space; his friend is only backup, sitting at mission control pathetically holding a Polaroid of the two men together in their space suits. 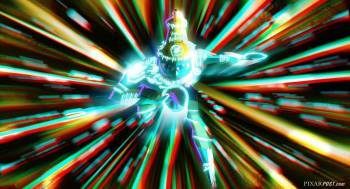 Then the man in space is lost, and his friend cannot bear it and literally goes insane, catatonic inside his space sit. The ending is inconclusive but touching. A Russian viewer has said on IMDb " is impossible to watch it without breaking into tears." That too is Russian. But this film clearly has a soul. The line drawing of the animation is simple, clear, satisfying. Bronzit has been nominated before. These are all worthy, except maybe for "Prologue." 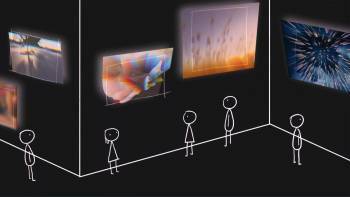 It seems a tossup between "World of Tomorrow" and "We Can't Live Without Cosmos." It's intellect and wit vs. soul. Country of origin: United States. Preview here. I got to see this one: it's on Netflix streaming -- and it was so interesting I wrote a full-length review.